Some Lagosians on Sunday said celebrating Valentine’s DAY on the same day that most Christians will start observing the 40-day Lenten season might cause some conflicts of interest. They said this in separate interviews when they were informed that this year’s Valentine Day and Ash Wednesday both fall on Wednesday, Feb. 14. 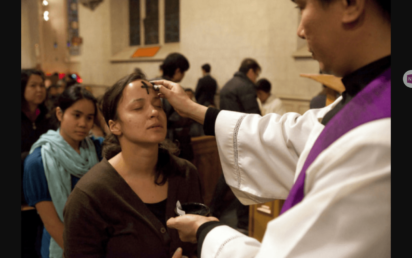 On Ash Wednesday, Christians are expected to receive Ash on their foreheads, fast by not eating foods and refrain from some social activities. They are also expected to engage themselves in prayers and in charity works from Ash Wednesday till Holy Saturday when the season of Lenten will be over. This was to make them, followers of Jesus Christ, to comply with what he did while on earth. He fasted for 40 days and 40 nights, suffered persecution, died on Good Friday, and rose from the dead on Easter Sunday. Also during the commemoration of St.Valentine’s Day, usually on Feb. 14 of every year, people celebrate it by sending cards, flowers, chocolates and messages of love to loved ones. In recent years and with the advent of eateries, youths always invite their spouses to eateries, cinemas and other recreational centers to celebrate the day. Mr Hillary Okongwu, a legal practitioner, said that the unusual timing of the two events would definitely not affect his celebration of love on Feb. 14. Okongwu said that while Valentine enjoins him to show love to the world, Ash Wednesday was to him, a gentle reminder of mortality. He said that it was a reminder that he needed to keep his mind focused on the ultimate goal of making heaven. “The combined effect of both events shows that I, as a person, must strive to show love to the world as much as I can because no man will live forever. “The celebration, however, carries a deeper message than the superficial celebration. “The world is torn apart because of lack of love among men. “Our family and societal experiences lend credence to the fact that for any meaningful development to take place there must be peace and love. “ Peace is borne out of love for your fellow man. Lent is ultimately important to keep our spiritual minds rejuvenated and to remind us of our spiritual destination,’’ Okongwu said. Irebowale Ogebule, an entrepreneur, said that some Christians might not participate in the Ash Wednesday church activities because of their own Valentine programme. Ogebule said that the fact that this year’s Season of Lent commences on that day means that a lot of people might prefer to ignore it and invest in their love life. She said that most of the youths would rather hang out with their friends at the cinemas to watch romantic movies. “I think developing the spirit mind is a personal decision. We don’t have to wait for Lent to do that. “ Most Pentecostal churches have their own season of fasting and personal intercession with God. “It is also important to know that the commemoration of Valentine Day has an impact on businesses which contributes to economic growth. “ Valentine Day celebration can contribute and stimulate the economy of our immediate society. It can be very significant to the core capitalist. “As you know, no matter what you sell, you will still have people to patronise you on that day. “People who run eateries, beer parlour, restaurants and clubs will make their sales that day because that is where many people will hangout. “Meanwhile, we must not forget that because that same day is when most Christians will commencement this year’s Season of Lenten will reduce sales. “Foods to be consumed by Christians will reduce and of course alcohol sales will practically be at zero level,’’ Ogebule said. Kehinde Dosunmu, a marketer, said that Valentine Day did not mean anything to him as a member of the Redeemed Christian Church of God (RCCG). He said the RCCG fasting and prayer was still ongoing noting that showing love must not be restricted to a day celebration. He said that he always show love to anyone around him because God is love. Ms Faith Okeke, an official with Wale Adenuga Production, said the coincidence of the two events, would not affect her from serving her God. Okeke said that she would participate in the reception of the ash in her church on Feb. 14. She said that the Season of Lent starting on Ash Wednesday was more important to her than a celebration that would be short-lived. She said that putting both on a scale; the Christian activities for the day would carry more weight to her more due to its importance. “The fact is that Christians don’t joke with such days. It is holy and sacred’’, she said. An events’ planner, Miss Nancy Anuforo said that she might not participate in the religious activities attached to this year’s Ash Wednesday. Anuforo said that she would be hanging out with her fiancée who would be travelling down to Lagos for both of them to celebrate Valentine Day together. “Since it is the beginning of the season of Lent, l can still catch up, just let me enjoy myself before the season thickens. The post Valentine Day, Ash Wednesday celebrations hold same day: Lagosians react differently appeared first on Vanguard News.